Hey foodie friends and happy Friday! I keep having these cravings for different fruits. First it was raspberries, then peaches and now it's pineapple. I've been just thinking of different ways to enjoy the fruit and then I thought...grill it! Unfortunately, I don't have a grill, so I decided that I should try some sort of marinade on pork, so I came up with this delicious recipe. 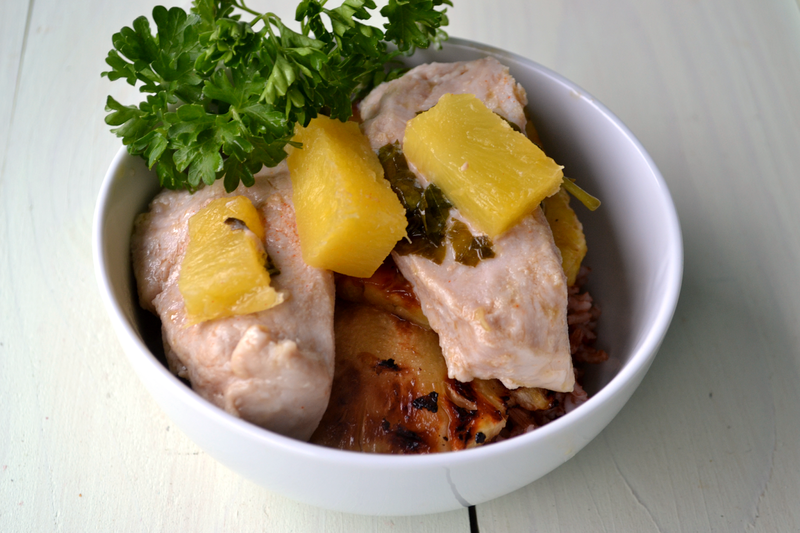 So if you're in the mood to make a fun, flavorful dish you'll need a few simple ingredients. The night before you make the dish, combine the ingredients in a large ziplock bag. You'll want to toss it around a couple of times to make sure that the the pork gets covered in the oil, basil and garlic. Save the other half pineapple for plating the dish. Let the marinade sit over night, or at least 10 hours. After letting the pork take in the marinade, you'll be ready to bake it. put the pork in a large glass dish and cover with tinfoil. Bake at 375 at 45 minutes. 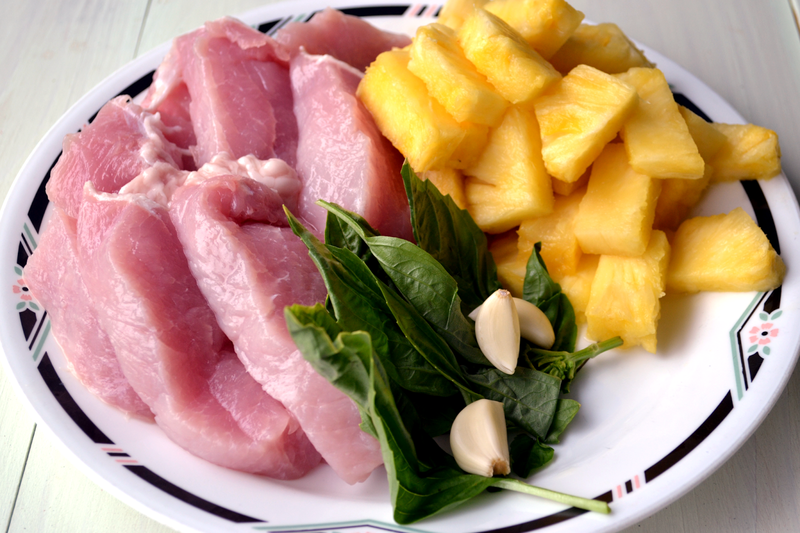 While the pork is baking, take the other half of the pineapple and cut into slices. Sear the pineapple in a medium pan with some olive oil. This will brown the pineapple and seal in the sweetness. 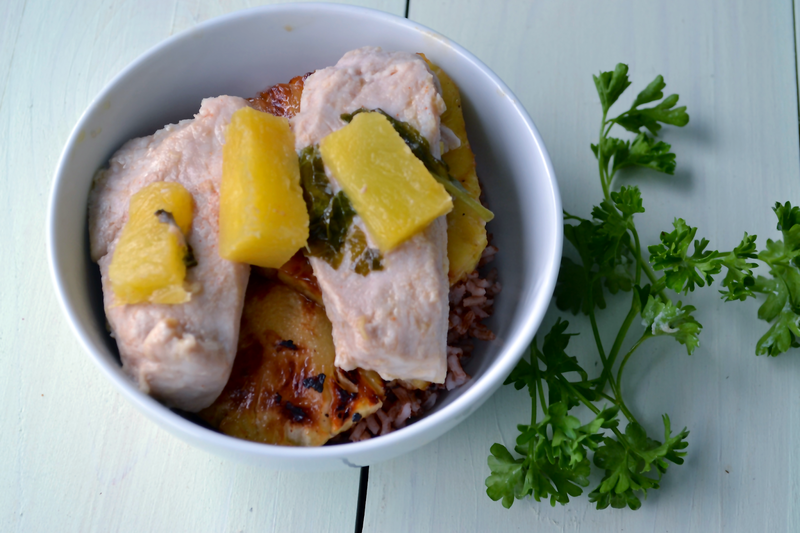 Serve the pork over a bed of rice, sliced pineapple and then put the pork on top. Take some of the liquids from the glass dish and drip over the top of the dish.